With the news cycle endlessly taken over by the latest madness emerging from the mouth or Twitter feed of the White House, could we step back from the circus to reflect seriously on the social and historical forces that produced the Donald Trump presidency? Haymarket Press’s new collection of essays by leading left political analysts, U.S. 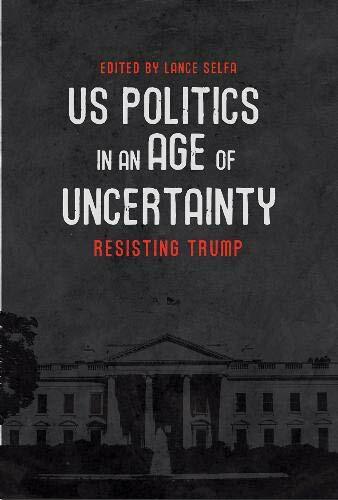 Politics in an Age of Uncertainty: Essays on a New Reality, is required reading for anyone interested in such reflection. Each contributor brings their own distinctive slant to this core thesis. In the volume’s opening and sixth essays, Sharon Smith and Lance Selfa show how the Democrats opened the door to Trump’s right-wing pseudo-populism with their dedication to neoliberal orthodoxy and their failure in officer under Obama to meet the needs of working-class Americans. In the fifth essay, sociologist Neil Davidson sees Trump’s victory as part of a global phenomenon —the unsettling rise of right-wing nationalist populism in the vacuum left by the decline of a serious anti-capitalist Left. According to historian Nancy Fraser in the book’s final essay, first published just more than a year ago, Hillary Clinton’s ignominious defeat marked “The End of Progressive Neoliberalism”—the defeat of “an alliance of mainstream currents of new social movements (feminism, antiracism, multiculturalism, and LGBTQ rights), on the one side, and high-end ‘symbolic’ and service-based business sectors (Wall Street, Silicon Valley, and Hollywood), on the other.” By Fraser’s account, “progressive neoliberalism” was “rejected in toto” by Trump’s deindustrialized and rural white voters. There are four basic problems with what Smith calls the “blame the white working-class narrative.” First, Trump only won the overall white vote by one percentage point more than did Mitt Romney in 2012—hardly what one would expect if Trump had ridden some great wave of white proletarian rage. Second, Trump’s base was relatively affluent. Fourth, most Americans without a college degree don’t vote so that “any measure of [political] patterns among those who do vote is a measure of a relatively high-income minority.” When we realize that “the many millions of people who did not vote . . . far outnumbered those who voted for either party in 2016,” it becomes clear that the biggest electoral story about the U.S. working-class in 2016 is that it sat out the contest between the two dismal pro-business candidates and parties, NOT that it made some (imaginary) wild shift to the white-nationalist right. Trump achieved this, Davis thinks, with “visceral white nationalism” but also with his “genius stroke”: keeping the evangelical right on board by giving it the vice presidency (the Christian proto-fascist Mike Pence) and power over the re-composition federal judiciary. Besides the “blame the white working-class narrative,” another suspect take (the other side of the identity coin, so to speak) on 2016 election attributes the Democrats’ failure to their alleged excessive “identity politics” efforts to win the votes of women, Blacks, Latinos, Muslims, and LGBTQ folks. U.S. Politics in an Age of Uncertainty rejects this storyline as well. The volume ends with two interviews, with Deepa Kumar and Justen Akens Chaco. These conversations remind us that the Bill Clinton and Barack “Deporter-in-Chief” Obama administrations advanced and continued many of the nativist, “border security,” and Islamophobic policies and narratives that have been taken over and amplified by Trump. Despite two key omissions—an essay on the central role that “Russiagate” has played in Democratic Party strategy and U.S. politics since Trump’s election and an essay on environmental politics—U.S. Politics in an Age of Uncertainty is a brilliant and indispensable intervention from the socialist left on the real historical, class, and sociopolitical forces at play beneath the national political freak show that is the new Age of Trump.